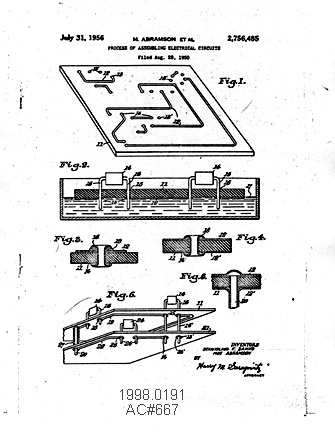 ...other attempts to simplify the manufacturing process focused on the interconnection of components. In 1949 Danko and Abrahamson [sic] of the Signal Corps announced the "Auto-Sembly" process,4 in which component leads were inserted into a copper foil interconnection pattern and dip soldered. With the development of board lamination and etching techniques, this concept evolved into the standard printed circuit board fabrication process in use today. Technograph Printed Circuits, Ltd. and Technograph Printed Electronics, Inc.